Want to know “Is Burnt Toast Bad For You?” then you’ve come to the right place. Today I will look at what the science says about burnt toast, is it bad for YOU?. According to the United Kingdom’s Food Standards Agency(1) the answer is yes. The agency issued a warning that people should reduce the amount of a chemical called “acrylamide“. This chemical gets produced when certain foods are burnt. This includes bread. This is not the only food safety agency to issue health warning’s. The “European Food Safety Authority” warned in 2015 that acrylamide “increases the risk of developing cancer for consumers(2)”. What is Acrylamide, is it a Health Risk? Acrylamide forms in starchy food that’s cooked at high temperatures(3). This chemical is not only found in toast it can be present in many starchy foods, like potato chips. The story of burnt toast revolves around the chemical “acrylamide”. The reason is studies have shown that acrylamide increases the risk of cancer (in animals). Interestingly Acrylamide is present in cigarette smoke and we all know how bad cigarettes are. In 1994 the reputable “International Agency for Research on Cancer(4)” warned that acrylamide is “Probably carcinogenic to humans“. This followed animal research that found the chemical damaged DNA and also causes cancer in animals. That’s not the whole story because up till now no human research has conclusively found a link between acrylamide and cancer. Acrylamide was first discovered in our food in 2002. Since then lots of studies have looked at the health risks. The results of these studies have had mixed results. Some studies have indeed found a cancer link but other studies have found no link. So at the moment the human health risks of acrylamide in burnt toast is inconclusive. Hence the evidence at present is reassuring concerning human research. But keep reading before you tuck into your burnt toast. 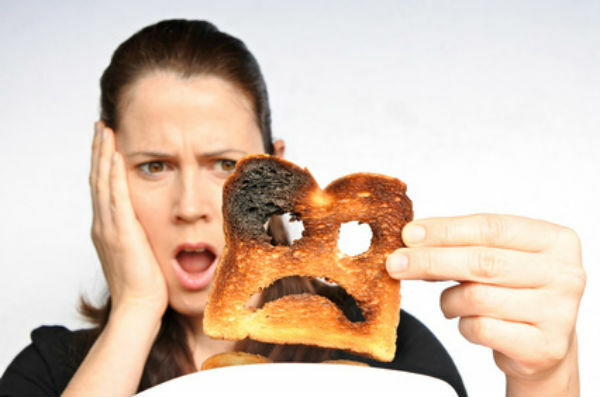 Should you Limit your Acrylamide (burnt toast) intake? More scientific research is need before we know for sure if burnt toast is bad for you. However as the saying goes it’s better to be safe than sorry. So unless you really like your toast burnt I’d stay clear. Until we know for sure just limit your acrylamide intake. It’s easy, toast your bread light brown instead of black. Cut down on the fries/chips. Try boiling your potatoes, this will help reduce the amount of acrylamide in your diet. These simple steps will help you reduce your exposure to this maybe harmful chemical. In comparison to the big cancer causers, smoking, obesity, alcohol. Acrylamide is down the risk scale. Giving up smoking, having a healthy weight and not getting drunk to often. Will have a much bigger impact on your risk of cancer. So KEEP healthy. By keeping to a healthy diet like we know we should. Eating your fruit and vegetables reducing the amount of processed food. Will also reduce acrylamide. A health diet will also have lots of other health benefits. Like helping you maintain your ideal weight. Also don’t forget to stay physically active. Keeping to a balanced diet, healthy weight and staying active will all help reduce your cancer risk.